Some Ogun State residents numbering close to 50, on Friday, protested the recent demolition of their buildings inside Regal Estate at Magboro by the Ogun State Government. 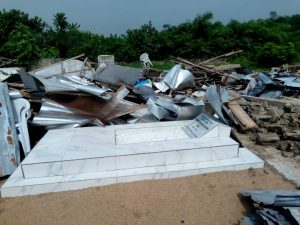 “It is a shame that a governor could just wake up one day and with less than two months left in office, descend so heavily on people whose only crime could be said to stem from buying plots of land in Ogun State and getting all necessary documents from the government of the same state,” the man simply identified as Ayeni, lamented. With the debris of the demolished buildings littering the site, Chief Nureni Farounbi, head of the family which owns the land, said the state government’s action is not only prejudicial but smacks of contempt of court. “It is shocking because this is not an area where we have the issue of acquired land because there has been no time the topic of paying compensation to our land has come up. As you can see, there is nothing the state government has done to us, no school, no hospital, no water or electricity or even road. The electricity you see here now was as a result of money the family contributed. “When the officials of the state government came, it was during service, the leader of the team threatened to demolish the building on us if we didn’t come out on time. We hurriedly rounded off the prayer session. “Initially, before the demolishing was carried out, some officials of the Urban and Regional Planning from Warewa Area had come to serve us notice of demolition. We were not afraid because we had all necessary documents concerning the land. He said: “When I saw them demolishing the houses, I asked them why they had to destroy our house, the only answer they could give us was that we built our houses on illegal land. The government officials also demolished a building owned by Mr. Ahmed Muhili, who said he was using it as a factory and just invested huge money into the factory just months ago after buying the factory from a foreigner last year. “When I wanted to buy it, I went to the Ministry of Lands to also chart it and it was there I discovered it was okay and I paid the owner. “We want peace, we had acquired our land before the present government assumed office, also paid all necessary money required by the state government”.